Stores reference 27P/15. Approximately 10.5 x 8 x 2.8cm. Gilt metal box. Printed with instructions to the top 'Immediately Opened Transfer Contents To Waterproof Bag : Bury Empty Container In Jungle Or Throw Away In Sea Away From Dinghy....' With Cadmium plated 'key' to open it/remove the lid. Unused/complete with contents. The tin has some small dents and corrosion marking from the quite heavily corroded key but nothing serious. Marked to top' J.L. Fairie 5/45'. 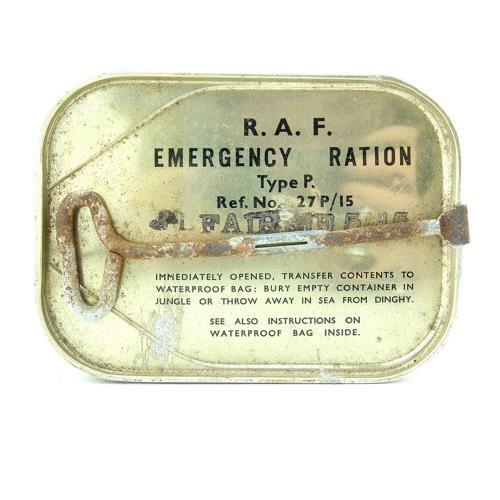 These rations were issued with the 'Beadon' flying suit, as part of 1941 Pattern Mae West 'Tropical' back pack and other escape/survival packs. They contained peanut toffee whereas the very similar looking MK.III had a more varied content. Stock code S18758.